I’ll admit, it took me years to become ok with the idea of eating raw eggs in any form (homemade mayonnaise, Hollandaise, etc. ), and even longer to accept that one in a cocktail would be at all palatable. 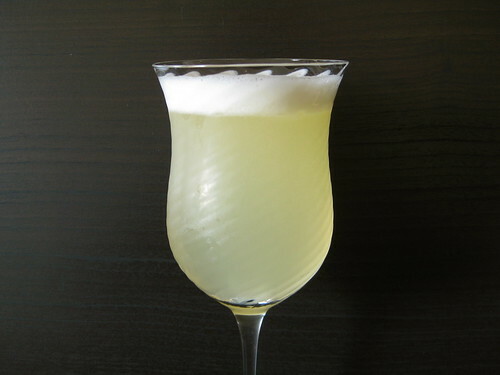 It is my friend, Clair, who introduced me to the idea of an egg-containing boozy concoction, the gin fizz — her family’s traditional New Year’s Day cocktail. Now, many years later, I must publicly apologize for initially scrunching my nose when I heard what it’s made of (sorry, Clair!). The gin fizz here uses only the egg white, which gives the drink a nice white, frothy layer on top with a slightly creamy mouthfeel throughout. Between the texture and orange liqueur, I cannot help but be reminded of a Creamsicle with every sip. (Albeit a far less sweet, more elegant and adult-only one.) I realize I’m playing fast and loose with the classic Ramos (a.k.a. New Orleans) gin fizz recipe, but it calls for orange flower water, something I’ve never stocked in my pantry (and in all likelihood never will, unless I stumble upon many more uses for it) — orange liqueur seems much more accessible. For me, this drink is a wonderful epitome of my main resolution for the year ahead, as cliché as it may sound: be more open to trying new things (foods, activities, etc.). Maybe I’ll pick up a bottle of that orange flower water after all. . . In a cocktail shaker or mason jar, combine gin through egg white and several cubes of ice. Cover tightly and shake vigorously until cold and frothy (about 30 seconds). Strain into a glass (about 10 ounce capacity) and top with sparkling water. Gently stir and serve immediately. ¹ I received email confirmation from Hendrick’s gin about it’s gluten-free status. Unfortunately, I cannot pass along the email, but they responded to my product inquiry (Is Hendricks gin gluten-free?) submitted through their website within three days. Please do the same if you would like reassurance! ² Grand Marnier will make for a slightly less orangey cocktail than Cointreau; I enjoy either. ³ Please note that consuming raw or undercooked eggs may increase your risk of foodborne illness, especially if you have certain medical conditions. I know hoe you feel about eating raw eggs. It took me some getting used to but I loved dished like eggs benedict too much! This drink sounds yummy though – even with the nice frothy egg white! Mmmmmm, anything with grand manier makes me a happy camper – looks like an elegant, not too sweet cocktail. Perfect! Great cocktail for the new year! Elyse: Eggs benedict is what got me on the bandwagon, too — the runny egg plus hollandaise was too much for me to resist! Kiri: Have you tried it warmed? It’s my mother-in-law’s favorite drink après-ski. That sounds GOOD. I had pisco sours in Peru, which also use raw egg. Fortunately, my Spanish is terrible so I had no idea what was happening until it as too late. It tasted so good I couldn’t be retroactively grossed out by the egg white! Thanks for the recipe, I’m going to try it this weekend! Thanks, Ariane! I’ve never had a Pisco Sour (or Pisco for that matter), but now I’ve very intrigued. Love the story and retroactive revulsion rationale :)! Hope you enjoyed the Fizz.